As financial markets tumble, the world's housing markets have continued to slide during the year to end-Q2 2008. 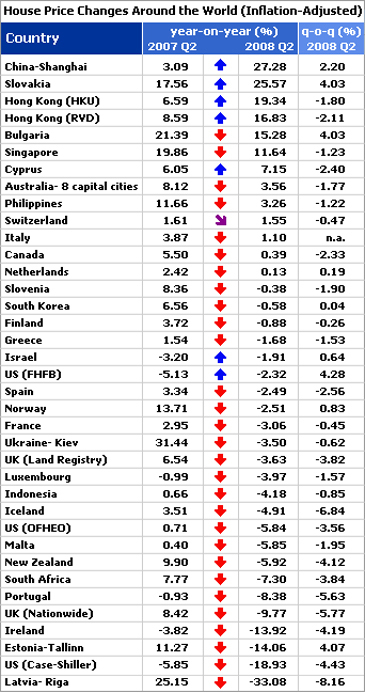 Inflation-adjusted house prices fell in 21 out of the 33 countries for which there is up-to-date published data. The Baltics, the US, the UK and Ireland led the global decline during the year to end-Q2 2008, the latest date for which comprehensive global statistics are available. The biggest house price declines took place in Latvia, previously a leader of the global house price boom. House prices in Riga have fallen by 21.23% in nominal terms during the year to end-Q2 2008, and 33.08% in real terms. Prices in Estonia's Tallinn fell during the year by 11.02% in nominal terms, and 14.06% in real terms. Quarterly data suggests that things are getting worse, with declines in inflation-adjusted house prices over the quarter in all except 9 of the 33 countries tracked. Latvia's Riga saw the largest quarterly decline during Q2 of 2008, with average dwelling prices falling 5.20% in nominal terms, and 8.16% in real terms. While quarterly data are subject to seasonal variations and are thus less reliable, the slide suggests that the situation is worsening. Since last year, there has been a dramatic turn-around in the world's housing markets. 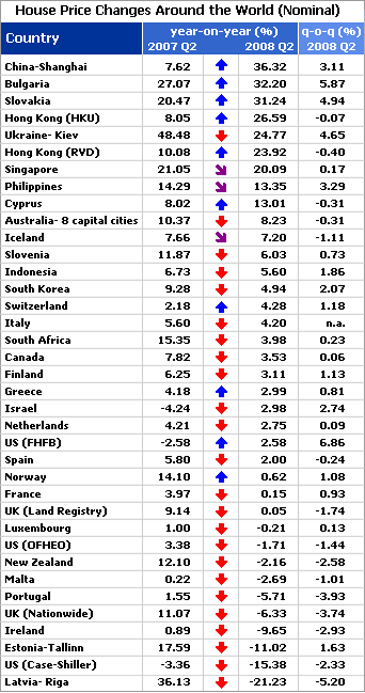 Only 5 countries out of 33, at this stage last year, had seen y-o-y declines in house prices in real terms. This year's total is 21. Even in countries which have continued to record house prices rises over the past year such as China (Shanghai was up 36.32% y-o-y in nominal terms at the end of Q2 2008, 27.28% in inflation-adjusted terms), transaction volumes have fallen sharply, suggesting that buyers are now nervous. While property markets in some regions such as the Middle East apparently remain in boom, it is hard to confirm this by reliable data. With the exception of Israel, none of Middle East's property registries, statistical institutes or central banks publish good data on housing markets. A final thought: It seems interesting that Slovakia's house prices are still accelerating, having risen 32.20% this year (a rise of 25.57% in inflation-adjusted terms), as against a rise of 20.47% y-o-y to end-Q2 2007 (a rise of 17.56% in inflation-adjusted terms). Clearly, the boom in Eastern Europe is not entirely finished. There have also been strong price increases in Monaco, Montenegro and Albania, although no official house price statistics are available. The efforts to rescue the world's housing markets are becoming increasingly global. In the US, the authorities are seeking a US$700 billion "mother of all bailouts" package to purchase almost all of the country's bad mortgage debt in an effort to unfreeze the nation's credit markets. In the year to end-Q2 2008, house prices in major US cities fell 15.4% (18.9% in real terms) from a year earlier, according to the Case-Shiller house price index. It was the sixth consecutive quarter that the house price index dropped year-on-year. In the UK, the stamp duty exemption has been raised to £175,000 from £125,000 for houses purchased from September 2008 to September 2009. The government also unveiled a £1 billion package to assist first time home buyers and households struggling with their mortgage payments. In Sept. 2007 Northern Rock, one of UK's largest lenders was bailed by the Bank of England. In the year to end-Q2 2008, house prices in the UK fell 6.33% (9.77% in real terms) from a year earlier, according to Nationwide. In Spain, the government released a €3bn rescue package. Certain real estate investment companies were given tax breaks to rent out unsold new homes for a fixed period. In the year to end-Q2 2008, house prices in Spain rose 2.00% (a fall of 2.49% in real terms) from a year earlier, according to official statistics (which are widely believed to understate the problem). In Ireland, the 2009 budget will include a "stimulus package" providing assistance to first-time homebuyers. During the year to end-Q2 2008, house prices in Ireland fell 9.65% (13.92% in real terms), according to official statistics. In South Korea, the government is set for tax breaks and easing restrictions on construction. In the year to end-Q2 2008, house prices in South Korea rose 4.94% (a fall of 0.88% in real terms), according to official statistics. Thailand and Indonesia are mulling the relaxation of foreign ownership limits to lift their housing markets. During the year to end-Q2 2008, house prices in Indonesia rose 5.60% (a fall of 4.18% in real terms), according to official statistics.